The fuel shutoff in my '87 34 has a "T" handle and is located to the right of the Admiral gauge panel in the port coaming. See attached pic. Jib sheets etc. often get caught on it and its a PITA. The cable has failed and I'm planning on going with a knob and moving it lower between the aft and port seats. I'd appreciate input from others if they too experienced this problem and have resolved it. IIWMB I’d go with a shallow knob first — that may do it. Drill/patch holes if it’s still a pita. I don't think anyone would have experienced the same problem because that doesn't look like a stock instrument panel, at least I hope it's not. My boat is an '87 and isn't that far from yours(#0273)and came with a recessed instrument panel that encompasses all gauges and switches. It looks like you have the room to build and install a recessed box to mount the kill switch. Good info. My boat was re-powered in 2005, long before I bought her, and I was pretty sure the PO also installed Westerbeke\Universal Admiral panel at that time. It's mounted on a large piece of textured starboard that covers a good sized rectangular hole in the coaming. So, I have no idea what it looked like previously and sounds like was originally recessed. Just out of curiosity, any chance you could share a pic of what yours looks like? As you said, ours builds aren't that far apart and a good chance yours is what mine originally looked like. My boat is a later model but here is a pic of my instrument panel. There is a transparent cover over the instruments with access at the bottom for the key, the start button and engine shutdown T-handle. As scgunner pointed out, there is almost certainly room behind your panel to recess it if you wish but this would be a non-trivial project... certainly doable but possibly more than you'd like to take on at this time. The T-handle as it's installed in your boat does look like it's begging to snag lines or clothing. Ken's thought to replace it with a smaller, maybe spherical handle sounds like a good and simple approach that would reduce but not totally eliminate snags. Westerbeke\Universal Admiral panel at that time. It's mounted on a large piece of textured starboard that covers a good sized rectangular hole. No doubt jackleg marine installed a very nautical looking panel (covering the (whole) hole as it were) from the removed so-called "panel tray." AFAIK, the fiberglass panel trays (at least on the 30s) were simply gooped in, not fiberglassed in place -- so removal was relatively harmless to the coming. Knowing "how you are" (and your attic ) you could install a panel tray and recess the whole westerbeke shebang / stop cable handle. There were different trays made for different panels/years (my 84 tray doesn't have a flat for the cable; it exits through the panel itself (pic.) Which is a PITA -- it's possible for a well-meaning behemoth "assistant" (I mean guest) to forcibly extract the screws from the thin lip of the tray that the panel sits against (Don't ask.) Hey, if 1 lb force is good, 100 must be better. CTY parts (at least used to?) fabricate trays in-house (the molds were shipped to Fl) and would make it to size (less than the CD $$.) I know this because in 2011 I asked for a price on a new tray and had to supply exact dimensions and a pic. I wanted one with the full back intact (pic) to retard moisture/dirt/critters from taking up residence -- mine had the back hacked out by the precision factory techs (who also supplied a selfie.) Well, the next week I got an email that my new tray was ready to ship (which of course I was only enquiring about because I was contemplating enlarging my panel for another gauge.) AnyHEW, if you are interested I can dig out the info on the trays. Maybe they can make one that has a full front on which you can mount the smaller Wb panel yet cover the whole (hole). Great info guys and thanks for sharing all the pics. Its all very helpful, as always, when asking a question on this site! I really like the recessed panel and wonder why the PO changed it. Frankly, a question I often ask is "why did the PO do that?" Anyway, I think I'll take a few measurements this weekend and look in to the possibility of recessing, as Ken says, the whole shebang. Fortunately, all the holes for the panel, the fuel gauge and the fuel shutoff are in the starboard panel. Any more thoughts or pics are greatly appreciated! The Admiral panel being odd-shaped and not fitting the pre-existing recess in the panel tray (for the Seaward panel) the PO, rather than simply refurbing/reusing the Seaward panel (as Ron did) or doing it correctly, PO jacklegged it up using the easier, and I might add, much more nautical-looking method! "PO could have," but noooooooo! My 1990 panel with a Catalina Direct faceplace, (annoyingly branded by them). Just had another thought - a few years ago I got a quote from a Wb dealer for the stop solenoid and its bracket that fits on the D850 block. I think it was ~90. I contemplated adding a push button and trashing the cable when I re-do my panel. 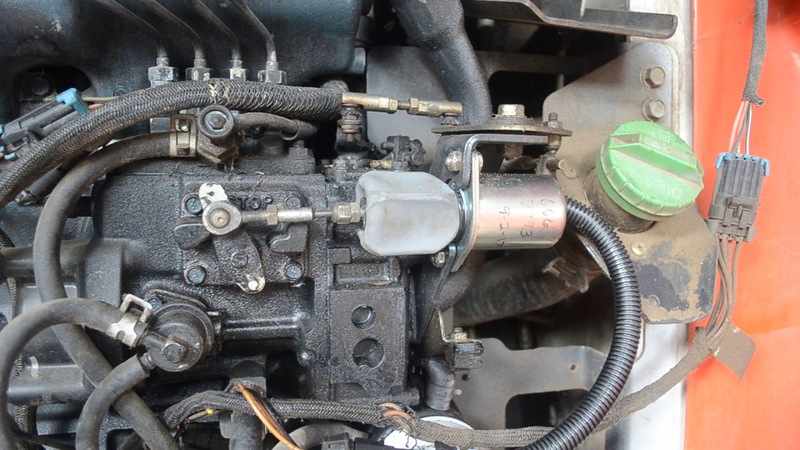 Some other applications for Kubota engines have solenoids instead of a cable and the marine/industrial dealer was able to supply one to fit, maybe an option for the XPB block also? Bill, before you even consider a solenoid, envision first how it will work. The M25 and M25XP engines stop function is mechanical. The cable pulls a lever on the starboard forward top side of the engine which shuts off the fuel to the injectors. One would have to know how the solenoid would work, since the shutoff on those engines is not electrical/electronic, as it is on some Yanmar engines. I do not know how it is done on the M25XPB engines, although I would imagine (i.e., guess ) that it is similar. Good luck searching for alternatives. Bill, I should have been more explicit ... the solenoid I referred to for my M25 is OEM Kubota; used on many non-marine applications. The OEM solenoid does operate the mechanical stop lever that Stu described. A solenoid was also used on some non-marine D850/950 (e.g., M-25/XP) applications as well. There's pros and cons to a stop solenoid, but it's OEM Kubota for our blocks. My Kubota manual shows there's two OEM solenoids for the "B" engines. One operates the stop lever, the other (appears to) operate the fuel rail directly? I haven't seen a pic of them installed so the above/below is not "gospel." I have to admit that the possibility of a solenoid instead of the cable is really intriguing. Knowing I’ve never really been fond of pulling a cable to stop the engine coupled with a final cost not being a tremendous amount more than a good Teleflex cable makes it even more enticing. That said, I also can’t help think that a cable is very reliable and if it fails as mine has a quick trip below with a pair of pliers easily shuts it down. So, I’m thinking the KISS principle might be the better approach for me on this one and I’ll likely stay with a cable. I’m definitely going to look further at recessing the panel which would also help keep it out of harms way. As always Ken, we can count on you to bring great suggestions, information and thinking outside the box. Just look at the pics and the exploded ISO, damn! Thanks again and keep it coming!